The Yenikapı site, located in the Istanbul neighborhood of the same name, witnessed one of the world’s largest archaeological digs between 2004 and 2013. During the construction of a new subterranean rail line linking Europe and Asia, hundreds of laborers and archaeologists of the Istanbul Archaeological Museums exposed remains of over 8,000 years of the city’s history, ranging from Neolithic dwelling foundations and burials to Ottoman cisterns and workshops. Most of the finds, however, originated from Constantinople’s Theodosian Harbor, an artificial commercial harbor built during the reign of Byzantine emperor Theodosius I (AD 379-395). This harbor was extensively used from the 4th to 11th century AD, after which the effects of gradual siltation had rendered it accessible only to small watercraft. By the 16th century, the harbor was completely filled in, and its remains lay forgotten for centuries. 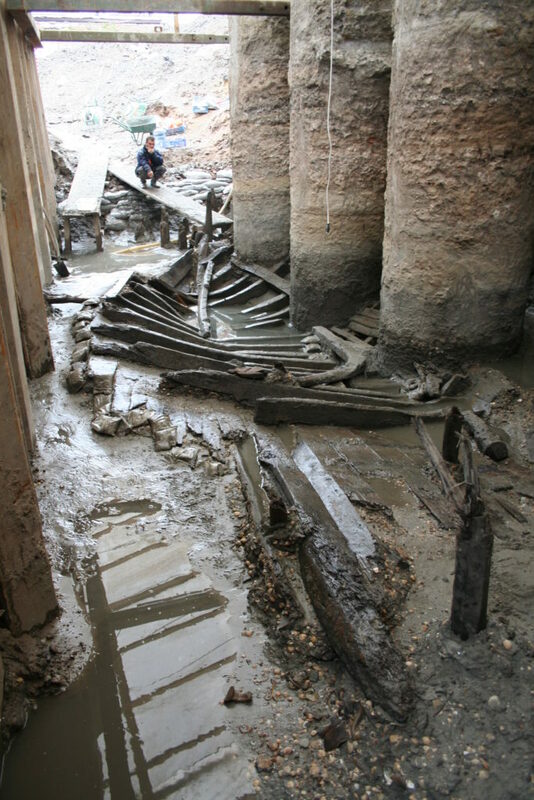 Thanks to the waterlogged anaerobic sediments that filled the harbor at Yenikapı, an impressive range of Byzantine finds were preserved at the site, including organic objects of wood, rope and leather, as well as pottery, bones, glass, coins, and other metalwork. In addition to hundreds of anchors and other items of ship’s equipment, archaeologists also uncovered 37 exceptionally well preserved shipwrecks of 5th- to late 10th- or early 11th-century AD date. These include the first archaeological examples of Byzantine rowed ships or galleys—almost certainly warships—as well as merchant vessels, a few with undisturbed amphora cargoes. While much of the site’s material is being studied by the Istanbul Archaeological Museums, the study and conservation of the Yenikapı shipwrecks was assigned to two organizations: Istanbul University’s Department of Conservation of Marine Archaeological Objects and the Institute of Nautical Archaeology at Texas A&M University. 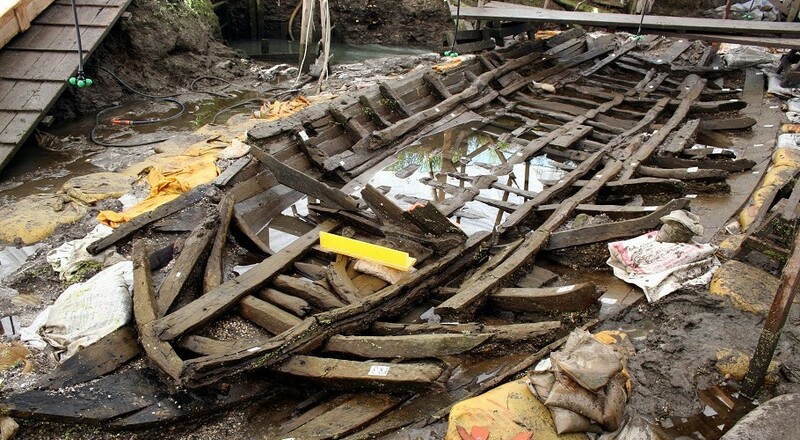 After their documentation, reconstruction and conservation, these shipwrecks will be returned to Istanbul to be displayed in a planned museum at the Yenikapı site. INA Vice President and Texas A&M University professor Cemal Pulak currently directs the study of eight Yenikapı shipwreck hulls dating from the early 7th to 10th centuries AD, four of which are being conserved at INA’s Bodrum Research Center under chief conservator Esra Altınanıt. 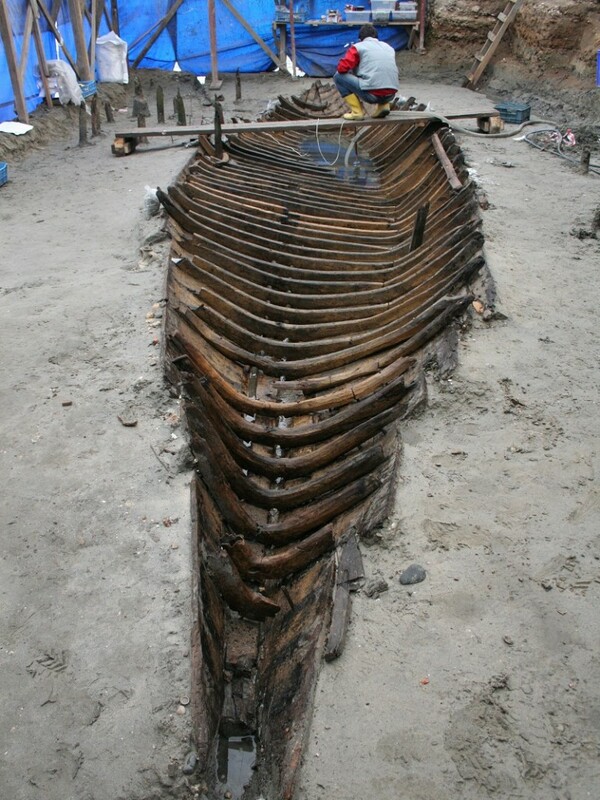 Pulak’s team, which has included nautical archaeologists Sheila Matthews, Rebecca Ingram, Michael Jones, Orkan Köyağasıoğlu, and Robin Piercy, along with other experienced archaeologists, laboratory specialists, and graduate students, have studied these eight vessels since 2005. Since 2018, undergraduate and graduate students from Koç University’s Department of Archaeology and History of Art have joined the documentation work at the INA Bodrum Research Center, with support from the new Mustafa V. Koç Center for Maritime Archaeology, the Honor Frost Foundation, and the Fred and BJ van Doorninck Byzantine Shipwreck Grant. Today research continues on these unique remnants of Byzantine seafaring. Kızıltan, Z. (ed.). 2007. Istanbul: 8,000 Years Brought to Daylight: Marmaray, Metro, Sultanahmet Excavations. Istanbul: Vehbi Koç Vakfı. Kızıltan, Z., and G. Baran Çelik (eds.). 2013. Stories from the Hidden Harbor: Shipwrecks of Yenikapı. Istanbul: Istanbul Archaeological Museums Press. Kocabaş, U. (ed.). 2010. Istanbul Archaeological Museums Proceedings of the 1st Symposium on Marmaray-Metro Salvage Excavations, 5th-6th May 2008. Istanbul: Istanbul Archaeological Museums Press. Kuniholm, P. I., C. L. Pearson, T. J. Wazny, and C. B. Griggs. 2015. “Of Harbors and Trees: The Marmaray Contribution to a 2367-Year Oak-Tree-Ring Chronology from 97 Sites in the Aegean, East Mediterranean, and Black Sea.” In Proceedings of the Research Center for Anatolian Civilizations’ Fifth Annual Symposium, “Istanbul and Water,” at Koç University, Istanbul, Turkey, 4-5 December 2010, edited by P. Magdalino and N. Ergin, p. 47-90. Ancient Near Eastern Studies Supplement Series 47. Leuven: Peeters Publishers. Pearson, C. L., C. B. Griggs, P. I. Kuniholm, P. W. Brewer, T. Wazny, L. Canady. 2012. “Dendroarchaeology of the mid-first millennium AD in Constantinople.” Journal of Archaeological Sciences 39: 3402-3414. Ingram, R. 2013. “Analysis and Reconstruction of Shipwreck YK 11 (c. Seventh Century A.D.) from the Theodosian Harbor at Yenikapı in Istanbul, Turkey.” Ph.D. Dissertation, Texas A&M University. Ingram, R. 2018. “The Hull of Yenikapı Shipwreck YK 11: a 7th-century merchant vessel from Constantinople’s Theodosian Harbour.” International Journal of Nautical Archaeology 47.1: 103-39. Ingram, R., and M. Jones. 2010. “The Documentation of Two Byzantine Shipwrecks from Yenikapı, Istanbul.” CMAC Journal 2.2: 28-30. Ingram, R., and M. Jones. 2011. “Yenikapı: Documenting Two Byzantine Merchant Ships from the Yenikapı Excavations in Istanbul, Turkey.” INA Annual 2010: 8-17. Jones, M. R. 2013. “The Recovery, Reconstruction, and Analysis of Yenikapı 14 (YK 14), a Middle Byzantine Merchant Ship from the Theodosian Harbor Excavations at Yenikapı, Istanbul.” Ph.D. Dissertation, Texas A&M University. Jones, M. R. 2015. “A Middle-Byzantine-Period Cargo Vessel from the Yenikapı Excavations in Istanbul: A Preliminary Analysis.” In Proceedings of the Research Center for Anatolian Civilizations’ Fifth Annual Symposium, “Istanbul and Water,” at Koç University, Istanbul, Turkey, 4-5 December 2010, edited by P. Magdalino and N. Ergin, p. 91-114. Ancient Near Eastern Studies Supplement Series 47. Leuven: Peeters Publishers. Jones, M. R. 2017. “The Hull Construction of Yenikapı 14 (YK 14), a Middle Byzantine Shipwreck from Constantinople’s Theodosian Harbour, Istanbul, Turkey.” International Journal of Nautical Archaeology 46.2 (September 2017): 253-83. Liphschitz, N., and C. Pulak. 2009. “Shipwrecks of the Portus Theodosiacus. Types of Wood Used in Some Byzantine Roundships and Longships found at Yenikapı, Istanbul.” Skyllis 9.2:164-71. Pulak, C. 2007a. “Yenikapı Byzantine Shipwrecks.” In Istanbul: 8,000 Years Brought to Daylight: Marmaray, Metro, Sultanahmet Excavations, edited by Z. Kızıltan, pp. 202-15. Istanbul, Turkey: Vehbi Koç Vakfı. Pulak, C. 2007b. “Yenikapı Batıkları: Fırtınanın Armağanı.” Arkeoatlas 2007:129-41. Pulak, C. 2007c. “Yenikapı Batikları.” Atlas 172:100-15. Pulak, C. 2007d. Yenikapı Buluntularının Teknoloji Tarihine Katkısı. Istanbul, Turkey: TTMOB Mimarlar Odası Büyükkent Şubesi. Pulak, C., R. Ingram, and M. Jones. 2014. “Galleys and Merchantmen.” TINA Maritime Archaeology Periodical 1: 8-25. Pulak, C., R. Ingram, and M. Jones. 2015. “Eight Shipwrecks from the Theodosian Harbour Excavations at Yenikapı in Istanbul, Turkey: An Introduction.” International Journal of Nautical Archaeology 44.1: 39-73. Pulak, C., R. Ingram, and M. Jones. 2015. “The Shipwrecks at Yenikapı: Recent Research in Byzantine Shipbuilding.” In Tradition and Transition: Maritime Studies in the Wake of the Byzantine Shipwreck at Yassıada, Turkey. Proceedings of a Symposium Held at Texas A&M University, November 2-4, 2007, edited by D. N. Carlson, S. M. Kampbell, and J. Leidwanger. College Station: Texas A&M University Press. Pulak, C., R. Ingram, M. Jones, and S. Matthews. 2013. “The Shipwrecks of Yenikapı and Their Contribution to the Study of Ship Construction.” In Stories from the Hidden Harbor: Shipwrecks of Yenikapı, edited by Z. Kızıltan and G. Baran Çelik, p. 23-34. Istanbul, Turkey: Istanbul Archaeological Museums Press. 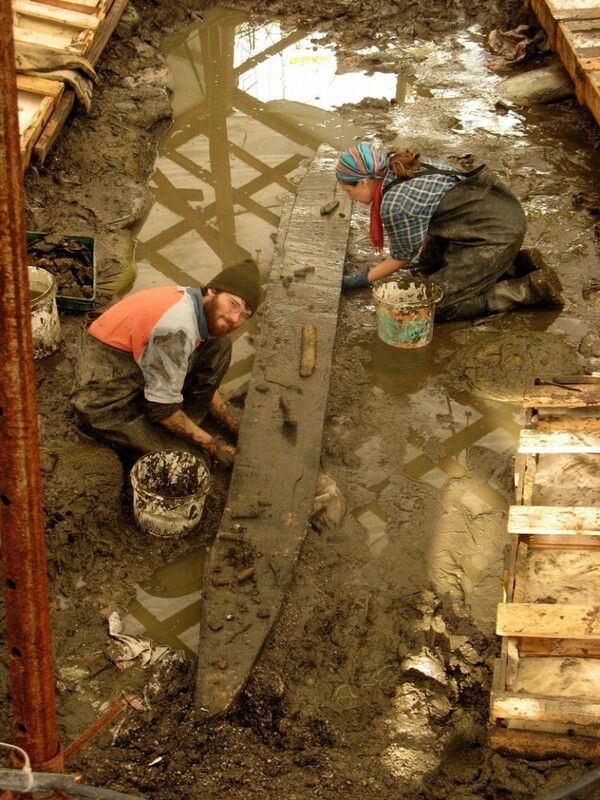 ABOVE: Michael Jones and Rebecca Ingram excavate the last in situ plank of YK 11 (Left Photo: INA). YK 14 during excavation (Right Photo: INA).